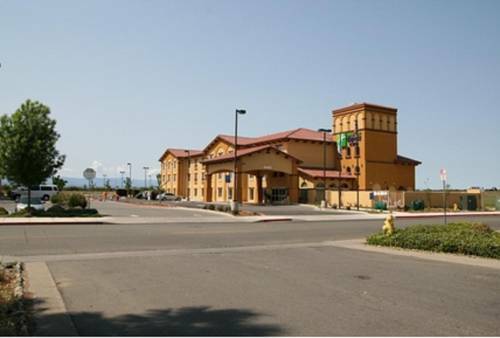 Stay Smart in the beautiful Sacramento Valley.The Holiday Inn Express Hotel & Suites Willows, CA stands midway between Sacramento and Redding. With quality comforts, superior service, and an ideal location, business and leisure guests alike will have everything they need to stay productive or to enjoy a comfortable visit. Business guests are sure to enjoy our Willows, California hotel's business amenities, which include free high speed wireless internet access, a 24 hour business center, and 1,200 square feet of meeting space, which can accommodate up to 50 people. In addition, we are in close proximity to local companies like Wal-Mart, Rumiano Cheese, Johns Manville, Land O' Lakes, and Sierra Nevada Cheese Company. The Glenn Medical Center is just one mile away as well. Activities abound near our Willows, California hotel's site. Guests can go hiking in the Mendocino National Forest or in the Sacramento Wildlife Refuge. Other nearby activities includes watching national races at the Thunderhill Raceway Park. Be sure to take a dip in our seasonal outdoor pool or to recharge in the 24 hour fitness center. Unlike other hotels in Willows, CA, we also serve a complimentary, hot breakfast bar each morning for your convenience. Call our 24 hour front desk staff today about your visit to the beautiful and scenic Sacramento Valley in northern California. Casa Ramos: Casual, family owned chain offering enchiladas, carne asada, and other great dishes! Black Bear Diner: Down home chain serving all day American comfort food and desserts. Elenita's Mexican Restaurant: Authentic and local Mexican restaurant. Childrens's program - Sycamore Park has a walking area, skate park, pool (open during Summer), areas for working out. Meeting Room: Spacious and modern meeting room that can be set to accommodate your meeting needs. Please contact the hotel directly for more information. Walmart SupercenterEnjoy Walmart Supercenter. Open 24 hours daily. Dollar TreeChain offering an eclectic mix of household items, beauty products, food and much more at discounted prices. Thunderhill RacewayA multi use motor sport facility for auto, motorcycle and kart club racing. Please visit Thunderhill's website for more information. Sacramento Wildlife RefugeThe Sacramento National Wildlife Refuge Complex is part of the US system of National Wildlife Refuges. Located in the valley of the Sacramento River.